The delirious agony of football can be summed-up by Joe Hart’s failing hands. 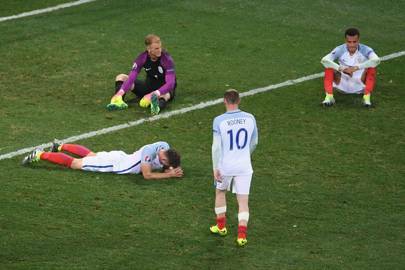 On June 27, 2016, as Kolbeinn Sigþórsson’s stroked the ball towards him, Hart floundered, his body collapsing as England whimpered out of Euro 2016 to a jubilant Iceland. England lost for many reasons, but one of them was abundantly clear: they lost their heads. For Football Manager, a game obsessed with simulating an oft-unexplainable world, Hart’s capitulation is rooted in a complex question: how do you simulate a footballer’s brain? Its latest iteration, out on November 10, wrangles with the psychology of the beautiful game like never before. “We’re constantly looking at artificial intelligence in the game,” says Miles Jacobson, studio director at Sports Interactive Games, the London-based developer behind the series. “We’ve been doing this for 25 years and we’re always, always looking at what we can do with the AI.” For players old and new, Football Manager’splunge into AI adds another layer of depth, complexity and realism. This is a game that contains enough depth and complexity to strike fear into the hearts of newcomers and near-unparalleled loyalty into the minds long-term fans. Critics of the series describe it as less game and more spreadsheet, an elaborate exercise in rearranging names and numbers between boxes; a success in delivering the mechanics of football but not the humanity and personalities that rest at the core of the beautiful game. The grand promise of smarter artificial intelligence is to add a more human touch to the game. Amongst the myriad of changes in Football Manager 2018, advancements in the implementation and presentation of the game’s underlying AI are part of a major push to make it feel less robotic. At the core of Football Manager’s new focus on emotions is its ‘Dynamics’ system, a means of observing and interacting with players on a more human level. Previously, this amounted to little more than publicly praising a player who liked being in the spotlight and having a quiet word with an introvert. This year, things get a lot more personal. Players have mental traits that determine their career aspirations; relationships with teammates; patience at being left out of the matchday squad; how loyal they are to you and or the club; and if they’re more comfortable as a leader or prefer blending into the background. These human characteristics don’t just impact each individual in isolation, but also the entire squad and a complex web of intra-squad relationships. Some of these attributes were in previous Football Managerreleases, but they’ve tended to lurk in the background. Now, you can readily observe and intelligently engage with a huge cast of characters. The new Dynamics gives you more access to what players are thinking – take player happiness, for example. A happy player is likely going to be more receptive to your tactical ideas and play better and with more enthusiasm than an unhappy one. “You have a happiness screen that is split into different sections, so you’ll always be able to see why a player is happy or unhappy,” Jacobson says. “We explain the knock-on effects of that happiness, too. If you annoy a team leader then we explain quite clearly that doing so is likely to have knock-on effects. If you annoy someone in a particular social group then that’s likely going to have knock-on effects in that group.” Some players are easier to make up with, while keeping key individuals on your side will ensure the rest of the squad toes the line. A heavier reliance on more advanced AI means Football Manageris no longer a game of training, picking and transferring players – it’s also about working out what kind of a person they are and then using that to motivate them to play better. In the real-world, managers are just as reputed for their ability to tap into the minds of their players as they are to exploit their physical talents. And now, thanks to AI, you can finally realise your dream of having the man-management skills of Mauricio Pochettino. While managing Watford recently, Jacobson fell afoul of his own game’s trap. With Troy Deeney and Andre Gray both wanting a first team spot, Jacobson signed another striker. Deeney was okay to fight for his place in the first team, but Gray got annoyed. “I told him that he can’t be in the team and he said he wanted to leave, which was fine and I thought that was the end of it. But a couple of other players thought that Andre should be playing and didn’t believe this new player should be ahead of him in team,” Jacobson explains. Subsequently, a number of players in the team became annoyed and Jacobson had a mini revolt on his hands. “You have to decide whether you’re going to stick to your principles or if you’re going to play him or appease him in some way in order to keep things calm”. Annoying a player by leaving them out of the team is nothing new in Football Manager. What is new is the complex series of events it can trigger. New visualisations and a more complex web linking players together makes dealing with situations more nuanced and gives you more power to make or break your team. “It’s going to be a lot easier this year to really anger your team quite quickly. But it’s only going to be easier because of things that you’ve done and mistakes you’ve made – rather than it being the game doing it for you.” And as emotions run high, managers start to lose control. Making players more human makes them less predictable, so building a team around stereotypes – leader, protégé, wise veteran – becomes impossible. That, in turn, encourages you to be more human in your use of agency over the game world. It’s a clever trick to pull off. Football Manager’s decades-long mission hasn’t been to imbue its reams of spreadsheets and drop-down menus with emotion, it’s been to make you respond, to make you feel. And to make you dress up in a suit when Northampton Town reach the FA Cup Final in 2020.